Melaleuca bracteata, Black Tea Tree grows into a small tree. The leaves are dark green, oval and scattered along the branches. Each leaf is equipped with a sharp point. Flowers are white and carried in clusters on or near the ends of the branches. The flowering season extends from August to November. M. bracteata is usually found growing along watercourses and may dominate riparian vegetation. The Black Tea Tree will cope with dry, well drained situations as well as wet sites. M. bracteata could be grown as a component of a native shrubbery or along the margins of dams and watercourses. 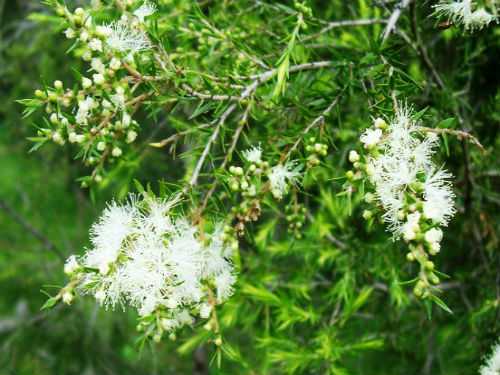 The Black Tea Tree has a wide distribution and is found in NSW, Queensland, Victoria, South Australia and Western Australia. In Central Australia it develops into a medium-sized shrub that grows amongst rocks. A number of cultivars are available including “Revolution Green” and Revolution Gold”. The names refer to the colour of the foliage. The common name refers to the dark grey, fissured bark and the species name means bearing bracts and refers to the flower clusters.